On August 23, Paraguayans woke up to news that resembled more the days of Stroessner’s dictatorship than those of a developing democracy. 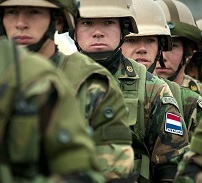 On August 22, Paraguay’s Congress had granted the newly inaugurated President Cartes power to unilaterally order military interventions inside the country. The amendments of Law 1337/1399 of National Defense and Internal Security come after the latest attack of the Paraguayan People’s Army (Ejercito del Pueblo Paraguayo – EPP), a rebel group that has staged a number of armed operations, including bombings, arson attacks, shootings and kidnappings. ?In its deadliest attack to date, on August 17, the EPP captured and executed five security guards at the Brazilian-owned Lagunita cattle ranch, near Tacuatí in the Department of San Pedro, 370 kms north of Asunción. 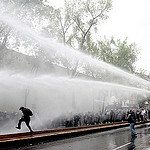 The attack was seen as a direct affront to the Cartes government, which in its inauguration on August 15, stated that it wouldn’t let the EPP set the agenda. The military recently stormed a local primary school asking the children if they knew where the EPP was. A local peasant who denounced the school raid to the press was later incarcerated for her supposed links with the armed group, in what could only be seen as a move to intimidate and silence the local population.? The local population is worried and scared of what a large military presence could mean for them. “People who have their farm cannot even go get cassava because they are afraid. The economic situation here is ugly enough and will be worse if we cannot even go to our farm to work. Maybe that’s the goal–to create fear in the population and get us out of here” said a villager.